In this case, we just want to use simple client-side jQuery to show/hide controls when the user selects a value from the dropdown without an additional round trip to the server. Additionally, we obviously want to have validation (with the normal Data Annotations attributes) but only if the fields are actually displayed. For example, if the user selects "Commute" then the fields related to the commute must be validated since they are visible – but we should not validate the other textboxes (e.g,. type of business) because they are not required if they are not visible. By creating a custom model binder that performs input validation (based on Sanderson's post where he uses an Action filter), we had our solution to the problem for server-side validation. Notice that in addition to showing/hiding the controls, we also enable/disable the controls by setting the "disabled" attribute. Setting the disabled attribute will prevent the element from being posted to the server on the form submission. When the user selects the "Commute" option i the dropdown, for example, we will fall into case "1" on line 22 – this will enable/show all the elements inside the <div id="commuteDiv"> and it will disable/hide all the elements inside the <div id="businessTypeDiv">. 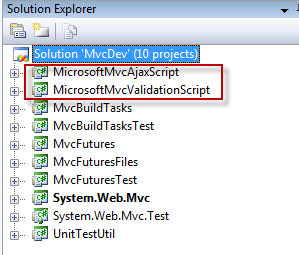 Once we build the project, it will produce new versions of MicrosoftMvcValidation.js and MicrosoftMvcValidation.debug.js which we can then copy into our solution to replace the original versions. 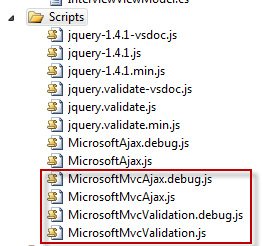 Now our scenario works end-to-end and now includes client-side validation behavior in the way we expect. Our form is no longer prevented from being posted to the server due to the hidden/disabled fields not having a value.